Waterford-based co-op the Little Milk Company exports to 17 countries worldwide. SELLING CHEESE TO the French may sound a little like exporting sand to the Middle East – but an Irish dairy co-op has proved it’s far from an impossible task. The Little Milk Company, a Waterford-based outfit set up by a group of 10 organic farmers in 2008, started out as a plan to get producers a better return for their milk and escape the fluctuating prices. However since 2012, the company has branched into cheese products – which it now exports to 17 countries, with Thailand the latest market added this week. Conor Mulhall, who has been chief executive of the company since its launch, says the business has already had some notable successes – not least carving out a niche in the French cheese market. “To be honest we wouldn’t have looked at France – only Bord Bia had a trade show coming up in the country and we thought should we give it a go,” he says. Four years ago, the Little Milk Company ended its first fully fledged year in business with products in SuperValu and Tesco stores, while it also exported its first shipment to Germany. However the overseas business has grown exponentially since 2013. While exports once accounted for only 5% of its trade, now the company ships 80% of its products outside Ireland. The German market has been the backbone of this growth, says Mulhall, because consumers there buy into the “clean, green view of an outdoor Irish cow”. But demographics are also coming into play in Europe’s largest economy – which in 2014 recorded the lowest birthrate of any major nation – leading to a boom in organic sales. “The Germans never get past the first child so nothing is too good for their kids, and the easiest person to sell organic food to is a mother for her children,” Mulhall says. The organic trend is also starting to take off in Irish shores – albeit from a much lower base. 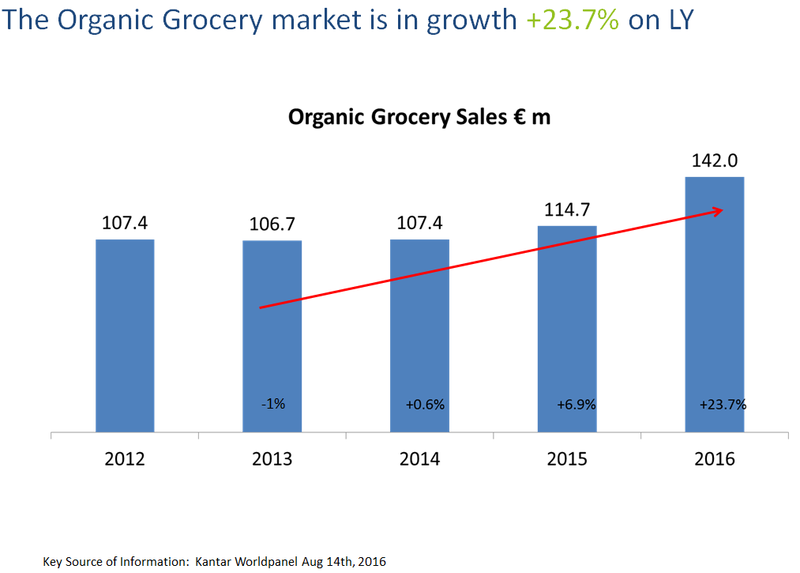 According to figures from Kantar Worldpanel Ireland, organic grocery sales in supermarkets jumped by nearly 24% last year to €142 million. Mulhall says he believes the organic push from local consumers probably comes from people having more disposable income now after the pain of the recession but also as a reaction to events like the 2013 horse-meat scandal. Nevertheless, the Little Milk Company is primarily targeting big markets like Asia, while also looking to improve its foothold in Germany, France and the US. The company has a target to increase its turnover by 40% this year, according to Mullhall. The most recent accounts for its parent company show a profit of just over €55,000 in the year to the end of March 2016. For the future, Mulhall says the company is also considering the recruitment of more organic farmers to the co-op. To be certified as organic, farmers need to prove their lands are free from pesticides and chemicals, a process that can take years. “There are 40 organic dairy farmers – but a lot are looking to get into organic dairy because the price of conventional milk went down around 20c (per litre) last year, while we were paying around 37c. Even though the company is expanding, the Little Milk Company doesn’t have aspirations to out-develop its name and compete with homegrown dairy giants like Kerry Group. But if an opportunity to sell the business came up, Mulhall says those involved would consider it.